We understand that event sponsors need fun photos of their wares at Los Angeles events and parties, so we take care to capture products in action. 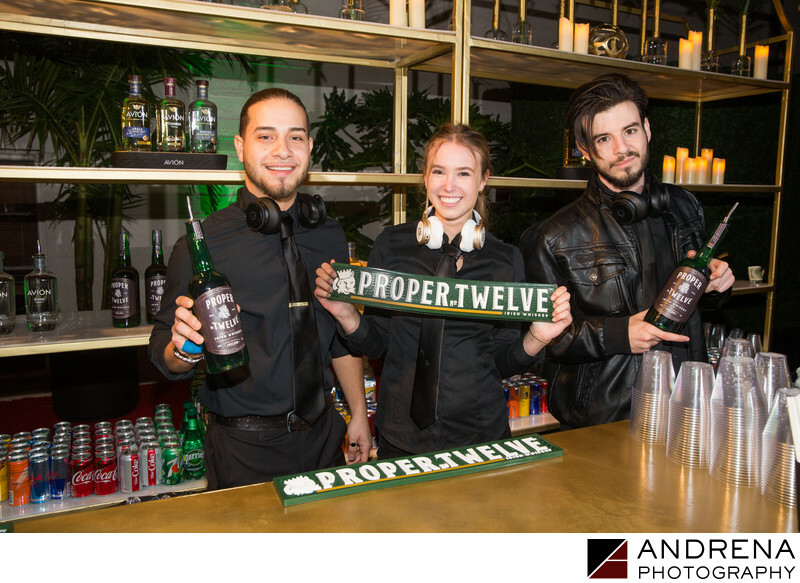 For this photo, we asked the bartenders to hold up bottles of Proper Twelve Whiskey, which was one of the sponsors of Offset's birthday party, produced by The Vanity Group. We took care to have one of the bartender's hold up the branded spill mats so the product name was visible, and we also had the other two bartenders make sure the bottle's labels were facing the camera. This seemingly simple photo involved moving things off the bar, taking care with positioning and skilled consideration of the product's branding. The end result was a fun photo that the event sponsor was able to use for its social media to show off its association with the Offset Set Gala event.